Minnesota couldn't stop the Rockets during the regular season. In Game 1, though, they changed their pick-and-roll tactics with some success. Contributor Liam Flynn breaks it down. Liam will be watching the Rockets closely all playoffs, looking at the adjustments they and their opponents make throughout their series. In this first article, he looks at the Timberwolves’ pick-and-roll defense. When Tom Thibodeau took over the Timberwolves, we thought we knew what would happen. One of the league’s best coaches would slowly grow a young group into a hardened, precise, regiment that would execute on defense and grind out possessions on offense. The team would win a little, and then a lot, becoming a young, up-and-coming team in the West. The results mostly match those expectations (though perhaps slightly behind schedule). But the style has not. Thibs’ Chicago squads never once ranked outside the top 5 in effective field goal defense, and only once were outside the top 10 in defensive rebounding. The Wolves ranked 26th in eFG% defense this year after finishing 29th last season; they ranked 24th this year on the defensive glass after placing 23rd in 2016-17. They haven’t cracked the top-20 in overall defense either this year or last. The Wolves, then, are certainly not a defense-first outfit. Their success has come at the other end, where they ranked 4th in the league this season. They win by outscoring opponents, not by stopping them. Which makes the Rockets an unfortunate first-round opponent for Minnesota. Not only because Houston was the league’s best regular season team, but because they were also its best offensive team. And sure enough, the Rockets shredded Minny’s D in the season series, with four fantastic offensive performances. 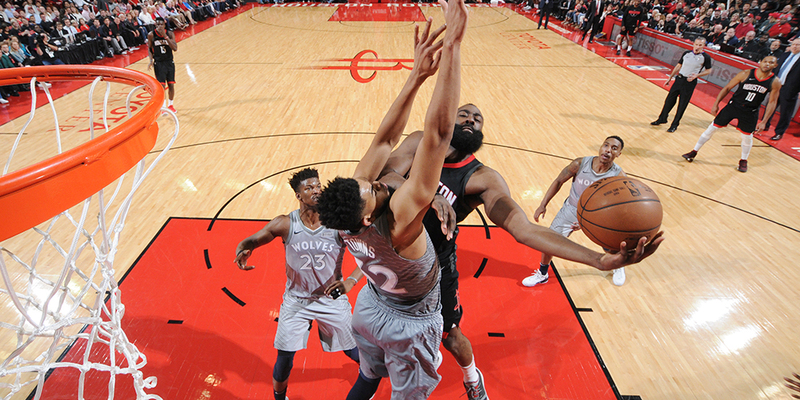 In fact, three of the Rockets’ top 10 offensive outings in the entire season were against the Wolves. Houston rained threes on Minnesota, shooting 43% from beyond the arc, with almost 80% of them assisted, 10 percentage points higher than the Rockets’ season average. Gulp. In particular, Minnesota struggled to contain the Rockets in pick-and-roll. It wasn’t for lack of experimentation, however — the Wolves showed Houston a number of different looks throughout the season series. But whatever they did, the Rockets seemed to have an answer.